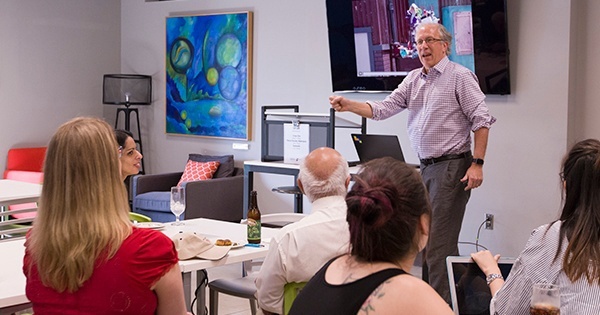 University of Delaware faculty are invited to the UD IDEA Network Third Thursday Faculty Social from 4 to 5:30 p.m., Thursday, Feb. 15, at the Venture Development Center (VDC). This program features UD faculty and an industry representative discussing challenges and opportunities related to the process of “making”. Each speaker will focus on the importance of “making” for 21st century higher education, how they teach students to “make” in their respective disciplines and how faculty and staff might incorporate “making” in their own courses. “Making” refers to designing, creating, embedding or coding something from scratch. Makers have the ability to turn an idea into a real life product. “I am particularly excited about this theme because teaching, mentoring and encouraging students to be makers is critical for their career paths, no matter their major,” said Martha L. Hall, a doctoral candidate in biomechanics and movement science. This month’s speakers are Professor of Art and Design Abby Donovan, former Executive Director of The Hacktory, Georgia Guthrie and Amtek Company Inc. Sales Manager Rich Sykes. Donovan has had art exhibitions and performances both nationally and internationally and Guthrie has worked as a user experience designer to create functional and intuitive products and websites. Amtek, the company in which Sykes works for has provided educators with engineering workforce and technical educational solutions and equipment since 1979. Each faculty social event will feature a different topic of discussion from virtual reality to robotics. The series will conclude on April 19, 2018 with a “maker crawl”, a mobile event in which participants will visit a handful of centrally located maker spaces, ending with the VDC. Refreshments and a social hour will immediately follow the presentations for a chance to interact and collaborate with faculty from across colleges.